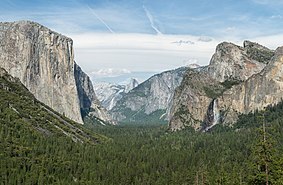 ↑ "Yosemite National Park". Geographic Names Information System. United States Geological Survey. ↑ "Park Statistics". Yosemite National Park (U.S. National Park Service). अभिगमन तिथि 22 July 2018. ↑ "Annual Park Recreation Visitation (1904 – Last Calendar Year)". U.S. National Park Service. अभिगमन तिथि March 1, 2018. ↑ "the definition of yosemite". www.dictionary.com.